MainAll NewsJewish WorldEzra Change: Hareidi to Torani? Ezra Change: Hareidi to Torani? Ezra Youth Movement, Israel’s 4th-largest, is celebrating its 90th anniversary – and is considering changing its name from "hareidi" to "Torani." The Ezra Youth Movement, Israel’s 4th-largest with 12,000 members, is celebrating its 90th anniversary – and is considering changing its name from "hareidi" to "Torani." A two-day conference marking the occasion is being held at Tzeitlin High School in Tel Aviv, and other events will take place at local chapters around the country. 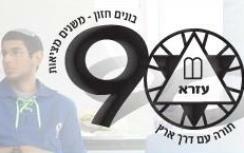 The central birthday bash event will take place Thursday evening, following a hike, in Yad Binyamin. Hassidic music star Yaakov Shwekey will perform, and Education Minister Gideon Saar will also be on hand. Issues to be discussed at the two-day conference include a discussion on whether and when to change the name of the movement from “hareidi” to “Torani.” Also on the agenda are the media, rabbi-student relatiosnhips, and more. Ezra was founded as a religious youth movement in the summer of 1919 in Germany, in the spirit of Rabbi Samson Rafael Hirsch but with the aim of moving to the Land of Israel. It describes itself as a “national hareidi” movement, and its motto is “The yeshiva is our house of education, the rule of Torah is our goal, and to the nation and land we will dedicate our lives.” Its goals include social welfare and educational volunteering and its members go on to army and national service programs, usually through Hesder and Mechina institutions. Ezra is named for Ezra the Scribe, leader of the relatively small number of Jews who returned to the Land of Israel following the 70 years of Babylonian Exile. The 42,360 “olim” (new immigrants) – each of whom are mentioned by family name in the Book of Ezra – left behind a life of religious and material comfort in order to deal with the challenges of rebuilding the Holy Land, spiritually and otherwise. Our essence: Ezra is the youth movement of the national-Torani youth in Israel, and is one of the Zionist youth movements in the State of Israel. Our objective: To educate a loyal generation based on strong Torah values and integrate it in all walks of life, while striving for excellence and the establishment of a Torah society in the Land of Israel. Our direction: Recognizing Torah as the paramount value; care in fulfilling the Torah’s commandments between man and fellow man and between man and G-d; faith in and adherence to our Sages’s teachings; combining Torah, Judaism and the world; education towards the value of responsibility for all of Israel and full partnership in building the Land.